Marianna Hubbard Slater (1824–89), daughter of noted newspaper publisher and mill owner Amos Hubbard and sister of James (#15), brought together two of Norwich’s most prominent families when she married John Fox Slater (1815–84) in 1844. The Slaters were the richest of all Norwich’s wealthy Gilded-Age families. As of 1870 John Fox Slater’s annual income was equivalent to $442 million dollars in today’s currency, making him wealthier than John D. Rockefeller, who was then just starting his Standard Oil Company. The Slaters’ assets did not protect them from tragedy; of their six children, only two, Marianna and William, reached adulthood. After thirty years of marriage, Marianna and John separated. 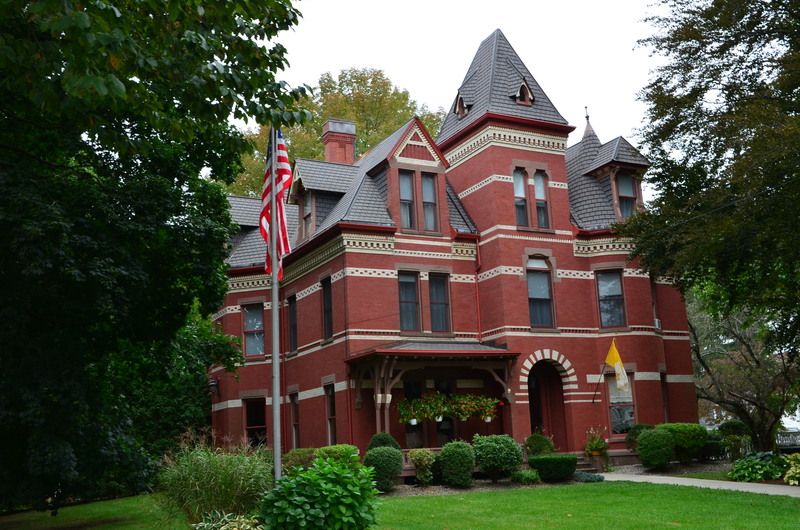 The couple remained married, but in 1876 Marianna moved to this eclectically styled brick house. She continued to enjoy a high standard of living thanks to her inheritance from her father, and to income provided by her husband. The mansion gains its distinction from its lively roofline and intricate contrasting trim. 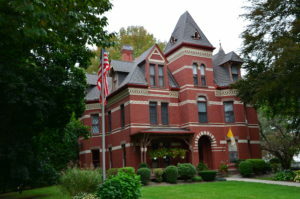 Its round-arched entry is a feature of the Romanesque Revival style, which was becoming fashionable in the 1880s. The house is currently the residence of the Bishop of the Roman Catholic Diocese of Norwich.